Oh wow, that looks great! We could really use something like that. Whoa, the Homeschool Kit is a hundred bucks! And the Family Kit is seventy. Whew, it looks great, but... Well, I'd really love to, but... That's too bad, I would have really liked to use something like this. So you can imagine my delight when I found out I was going to get to review some products from We Choose Virtues for free! That delight has only grown...and grown...and grown! Just when I think I've gotten a complete grasp of the Virtues program, I discover another delightful tidbit. For example, did you know that each Virtue Kid has a name that corresponds with the beginning sound of that Virtue? Hat Matt for Helpful, Oboe Joe for Obedient. This makes it easy for readers and non-readers alike to learn the virtues! The rules on the Three Rules Poster are easy to remember. The first rule is a one-word rule (Obey), the second rule is a two-word rule (Be Kind), and the third rule is a three-word rule (Be a Helper)! AND the rules are listed in order or priority. If a child is helping, but not obeying, he'll need to obey because Obey is the first rule. Simple, right? And, oh, so genius! 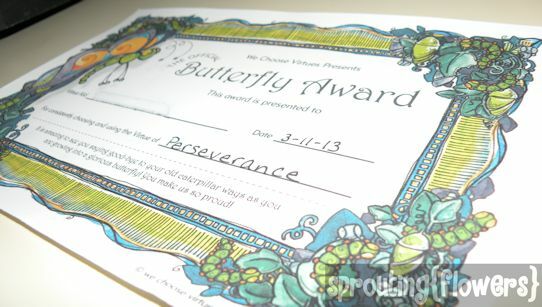 We Choose Virtues was started by Heather McMillan whose passion for seeing children reach their full potential led her to create a program that can be used to instill virtues in them that will empower them for a lifetime. Virtues aren't just a list of rules of conduct; they aren't a system of morality imposed on you from the outside. These virtues become a part of your character, a part of what makes you YOU. This internalization of the attitudes behind the Virtues is what will inspire character that lasts! Before I tell you how we've been using We Choose Virtues in our family, let me tell you how you can afford it! Instead of the Parenting Cards ($34.99), which include the story of one of the Kids of Virtueville and helpful tips on how to introduce and demonstrate that virtue, buy the Virtue Flash Cards ($14.99) or Virtue Clues ($5.50) and the Kids of VirtueVille Color-My-Story Book ($9.99). 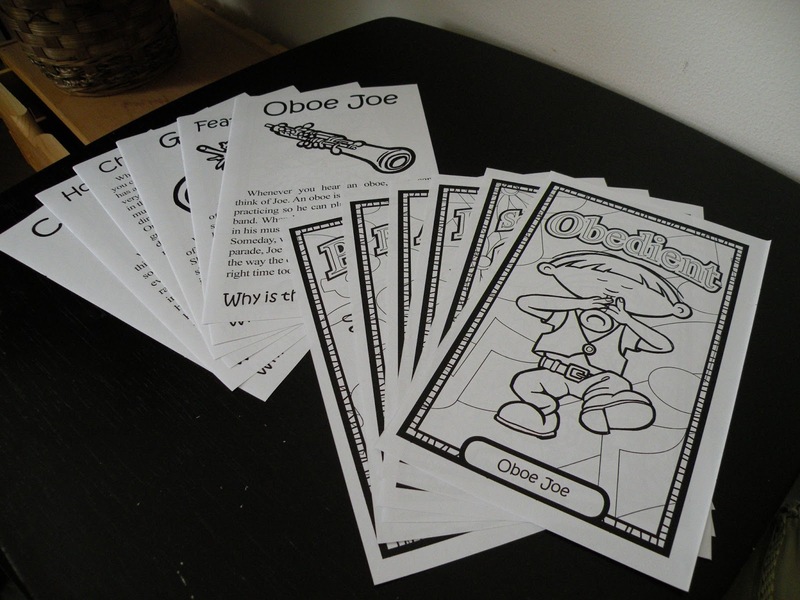 The Flash Cards and Clues cards don't have the Virtue Kids' stories (the stories tell why the kids have their names and are associated with that virtue), but you can read those in the coloring book. Don't you think $16 is a lot more manageable? Of course, you can add in some of the other fantastic products if you're able. Heather was kind enough to share a 15% discount code for my dear readers, so on anything you order, be sure to enter VIRTUE15 during checkout! Or, if you decide to get the Homeschool Kit, use HOME20 to get 20% off during the month of April! I wanted to put together a "bulletin board" for our virtue of the week, but being short on space and having no extra cork boards around, I made do with the front of our school cabinet. Miss M colored a "Virtue of the Week" poster I made. 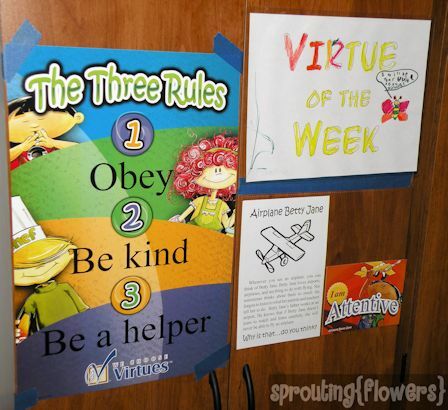 We laminated it and posted it above a sheet protector that I use to display the week's selected virtue and the Virtue Kid's story. (Yes, I cut apart the Color-My-Story Book.) I'm loving having a virtue on display because the kids and I can refer to it easily. 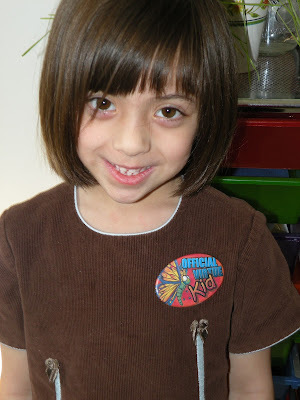 I also frequently catch Miss M standing there reading the story or chatting with her brother about the Virtue Kid. The stories have a catchy cadence to them when read aloud that appeals strongly to both of my kids. They love to hear them read aloud again and again…so much so, in fact, that they have several of them memorized! Each week we focus -- as a family -- on one virtue. We sit down together and read the story; we recite the virtue catchphrase and antonyms ("I am Diligent! I start fast, work hard and finish strong. I am NOT…slow to get started or lazy and I don't quit early!") Then at opportune moments throughout the week, either when the kids need to be reminded of that virtue or conversely when they're "caught" being virtuous, we review the catchphrase and antonyms again. 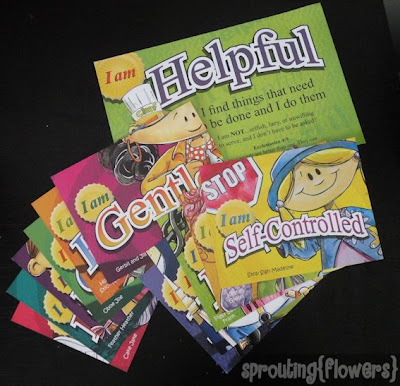 It's a really fun and effective way of correcting bad behavior and encouraging good behavior without always making Mom have to be the Bad Guy! One last thing: We Choose Virtues will soon be available in Spanish and a version for older kids is in the works! Great review and I love how you showed how to have an affordable,successful program.I love the weekly board as well.we homeschooling mamas definitely know how to make do and make it work amazingly well. What a great review. I really liked that you showed how to afford to buy it and different options. Great review - thanks for sharing it!